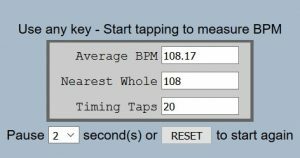 Beats per minute (BPM) is a major component of your song. It’s basically the tempo of your song. It helps set the overall tone of the message, creates the baseline for a groove, and provides one of the first dynamic elements you’ll need in writing a song. Keep in mind, sometimes BPM can be fast, but the lyrics slow (e.g., Keith Urban does this a lot). BPM is a tempo you’re creating. It’s not meant to dictate how you write lyrics for the song. In other words, you don’t need a word on every beat. A fast tempo doesn’t always mean a lot of words! More on that later. So – why is it important to know the BPM of your songs? Are you writing songs that all fall within one BPM range? As your skills grow and you have pitchable songs, is your BPM matching what the artist is looking for? 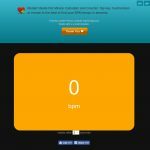 My Favorite Beats Per Minute Online Tool? This one is so easy it’s ridiculous and it’s accurate. Just tap a key and it counts out the beats. Record yourself and start tapping! Pro Tip: Make sure you enter the BPM in your song catalogue database. This will help you with targeting your song pitches later. I pulled the direct link to the BPM tool, also a tap and display function that’s pretty bare bones, but very handy. No ads, or pop-ups to worry about. 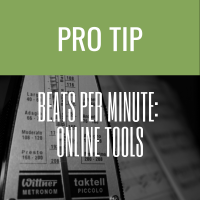 If you go to all8.com/tools you’ll find some additional browser-based functions to click on like Measures Per Minute, Guitar Delay Effects Timing, and Frames Per Beat for video. The Korg MA-1 is simple to use and the one I have. Works as a tuner too. 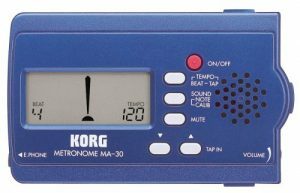 Manual metronomes require a bit of back and forth, but once you’ve done a few hundred songs you should be able to get close enough with your initial guess to hone in on the BPM pretty quickly. These are better for practicing with than finding your BPM. They’re also great for changing the BPM of your original just to see if you can give your song a different groove. 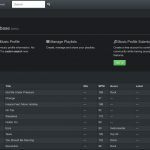 This is a community-generated database of BPMs, so caution! It’s listed here only because you may have a need to quickly check the BPM of a song you might be using as a ghost songwriting exercise starter. I’m not a fan of user-generated content for databases since it’s so open to false information. And you’re limited to the knowledge of the people they’ve attracted to the site who want to spend time populating someone else’s site with content for free. Regardless, in a pinch it may help you, so I included it. Want More Ways To Write Better Songs Faster? Songwriting Worksheets can help you approach your songwriting differently. Check out these songwriting worksheets based on skill level!